In 1838, John E. Dunham came from the east in search of a new home and settled in southeast Wisconsin. He purchased 80 acres and built the first house and barn. It was located where the Chartier Hotel used to stand at 1003 Main Street. In 1846, the first school house was built called Union School because it brought together several outlying school districts. 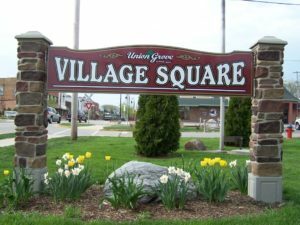 The village got its name from Governor Dodge who combined the school’s name with grove for the beautiful grove of burr oak trees on the west side of Highway 45. 1844: the first church of Union Grove was organized six years after the Sunday school started. On June 1, 1893, Rev. Frank Dexter and his wife, Rev. Mabel Dexter served the Union Grove Congregational Church. 1882: The first brick school was constructed with the west wing added in the 1890’s. In the 1920’s the building became Union Grove’s Masonic Temple. 1900: Four Year high school had 13 graduates with a faculty of 3. 1902: On July 14, Old Settlers Society incorporated and purchased a 12-acre park. 1903: State Bank of Union Grove incorporated and erected a building on the east side of Main Street. 1904: On June 24, Fire destroyed Commercial Hotel, Myers Opera House and Weiler’s Saloon. 1905: Box stoves were discarded from the elementary school and pot-bellied upright, coal burning stoves were installed. 1906: The Union Grove Telephone Company contracted with the Wisconsin Telephone Company for long distance service to each patron. 1907: On August 27, Alby Blacksmith Shop was established. 1908: September 1, National Mutual Benefit Colony was chartered. 1910: Meeter’s Kraut Factory was built in Union Grove. G.R. “Bob” Cornell was plant manager. In addition to sauerkraut, pickles and tomatoes were processed at various times at the factory. 1914: The Union Grove Lumber and Coal Co., with Merritt Anderson as manager and John Huck, secretary, served the Union Grove area with quality coal and building materials of all kinds from lumber to fencing, beginning this year. 1915: On January 7, Union Grove Lumber & Coal Co. was incorporated. 1916: During the early morning hours of Friday, March 24, a disastrous fire broke out. The fire engulfed eleven of the most important and centrally located business institutions on the west side of Main Street. This was one of the largest, most disastrous fires that Union Grove has ever witnessed. 1917: Racine-Kenosha Joint County Training School for Teachers was established in Union Grove. Arthur J. Smith was principal and Blanche E. Roberts was the supervising teacher. The school building was completed. 1918: Menzo J. Bixby – first Union Grove boy to die in WWI. 1919: Southern Wisconsin Home for the Feeble-Minded opened. It became an expansive community with buildings later placed on State & National Register of Historic Buildings.1919: On December 31, Post 171, American Legion was chartered. 1920: Enrollment in teacher training was 34. 1922: Teachers’ Training School burned. 1923: Union Grove library moved to a small office building formerly occupied by the Dardis Lumber Co. located at the corner of 10th and Main. 1925: The Union Grove Methodist Church was originally located in Church Street north of the railroad tracks. The building was moved to its present location at the corner of State Street and 12th Avenue.1925: The Union Grove Graded School, on 14th Avenue was erected. Roy Lehman was the principal and upper grades instructor. 1926: Roberts & Jensen Ford Garage, erected in 1926, was located on Mill Avenue, just east of the Hotel Shepherd. 1927: Floyd Coling built a big hall. 1928: Mr. and Mrs. Charles Hackett came to Union Grove and began publication of the U.G. Sun. 1930: Martin’s Garage was established. 1931: Book rental fees for the Racine Public Library rose to $1,500 for the year. 1932: Dr. John W. Owen came to Union Grove in 1932 to practice dentistry. His first office was on the second floor of Hauper’s Drug Store on the west side of Main Street.1932: Permanent village library opened in the Parkway Hall on November 3. 1933: The first library board was organized on July 8, with John Bowers as president; Wesley Shepard, Secretary-treasurer; William Roberts and Edward H. Swantz, directors. 1934: Attorney H.H. Brown came to Union Grove in August. He purchased the law practice and home of Attorney O.R. Moyle. The Office was located in the second story of the “Kemp” building at 1114 Main Street. 1936: Ernie Swantz purchased the hardware store in the 1100 block of Main Street. The store had been formerly operated by Peter Dunkirk. Swantz handled wood heating stoves, kerosene and a complete line of hardware. Drought reduced crop yields and farm income that year. 1937: Dr. and Mrs. Owen Purchased the Callender residence at 1201 Main Street and moved his office and their home to that site for their dentist office. 1938: The elementary grade school didn’t have any clerical help in the office and there was only one custodian. 1941: When war was declared on December 8, Union Grove began to settle down to the business of fighting the war. The village was organized for civilian defense and any emergency. 1942: On July 8, a group of women were appointed to distribute ration books. At headquarters the books were explained as to the number of “points” allowed for each person in sugar, meat, fat, oils; four pounds per person was allowed for well fed Americans.1942: The Rescue Squad was formed with Dr. T.H. Wooley serving as the first captain.1943: Sgt. Elmer Hansen was killed in action in WWII. 1943: In September, the purchase of a Rescue Squad truck was made possible by donations from interested parties, the American Legion and the Village Fire Department. 1946: This year brought a drive for used clothing for European war refugees. C.W. Price resigns from the mail route after forty-one years. Sugar rationing is still on. 1948: The showroom of Martin’s Chrysler-Plymouth-Dodge was enlarged to accommodate the post World War II new car sales. 1949: Union Grove Lions Club chartered. 1949: Willie Markisen became captain of the Rescue Squad.1949: Addition to High School added in the fall. 1950: Since the 1924 School District built a school at the 14th Avenue location there were three classrooms and a multi-purpose room added. 1952: Two full time music instructors were engaged, one for instrumental and one for vocal study. 1954: Union Grove was hit by a tornado. 1955: Fourteenth Avenue school adds four classrooms along State Street. Elementary grade school enrollment was up to 335. 1956: Result of higher enrollment in 1955 was the addition of four classrooms and a rest room at a cost of $60,355. 1957: Fourteenth Avenue school adds two classrooms and a supply room. 1958: Fourteenth Avenue school adds two classrooms and an office. 1958: Dial telephone service starts in Union Grove. 1958: Groundbreaking for Graham Public Library. 1959: Graham Public Library was dedicated on October 25. 1964: On November 1, Rev. Keith Moore officiated at the ground-breaking ceremony for the new location of the Union Grove Baptist Church on Highway 11, west of the Village of Union Grove. It cost between $90,000 and $100,000. 1964: Shepherd’s Inc. opened in Union Grove to provide compassionate Christian care to adults with mental disabilities. 1966: An addition doubling the size of the high school consisted of a new gym, library, classroom and business education areas. 1967: The new education wing was completed on the Union Grove United Methodist Church. It was put into use later that year for Bible School and Sunday School. 1968: On May 13, St. Robert’s Catholic Church was dedicated. 1968: Union Grove Kiwanis Club was chartered. 1972: The Dover Branch of the State Bank of Union Grove was opened on Highway 11. 1973: American Roller construction began on a new facility in Union Grove. It now houses the Research and Development Laboratory, which services all American Roller facilities, and the Arcon Division, which manufactures small rollers in quantity, mostly for original equipment manufacturers. 1974: August 25, The Fire Station was dedicated. 1974: Marquette Savings & Loan opened a Union Grove office. 1976: July 20, the Overson Subdivision of the Village of Union Grove was recorded. 1977: Union Grove High School had enrollment of 1,042. 1986: Union Grove Chamber of Commerce expanded to include Greater Union Grove Area; opened first office in Police and Fire Department at 700 Main Street; hired first employee. 1988: September 17 : Sesquicentennial 150th Anniversary Pageant was held. September 18: Sesquicentennial 150th Anniversary Parade (videos of both of these events are available at the Graham Public Library).